Walking with a cane is wonderful when you've been stuck behind a walker for 4 weeks. I'm starting to get a hint of what it's going to be like when I'm all healed up. One of the little projects I worked on during my recovery was this silver leaf frame that I made, oh, say 18 months ago??? I always intended to make it a chalk board, but as usual, I got almost finished but not quite finished. Because I wasn't certain where I would actually hang it, I hung it from the curtain rod to hang in the window. I usually don't have the curtains closed so it just hung in front of the window. One night while we were eating dinner with friends, girl friend said "why does that frame have holes in it?" I said "I've always wondered that myself!" She immediately got up and got some foil and made some little fillers for the holes. Honestly, while it was hanging in the window the little foil balls worked fine. They kept light from shining through the holes and made them way less obvious. But when I finally bought a board and painted it with chalkboard paint and moved it out of the window I felt like I needed to fill the holes with something more permanent. It just happened that I had a wooden dowel that fit sort of perfectly into the holes. So I cut a bunch of little wooden plugs to fill the holes. Then I rubbed them over sand paper, used a little wood glue and stuck them in the holes. After that dried I turned the frame over and put a little more wood glue in each hole. After the glue dried, I silver leafed over the wood fillers. You can still see the holes a little if you look closely. There are a couple of things I could do to make them not show at all, but I'm not sure I want to dedicate any more time to this project. I have one other frame just like this and if I decide to leaf it I will do a better job - and fill the holes prior to starting the leafing. I'm thinking that it's good enough for me. For painting the chalkboard I used Rustoleum's Chalkboard Paint that I bought 10 years ago to paint a chalkboard wall. I've used it for countless projects and still have some left. I went ahead and seasoned it before I put it in the frame. I figured the more chalk dust I can keep off the frame the better. You DO season your chalkboards, right? You have to do this so the first things you write on the board don't burn their image on the chalkboard and show up forever no matter how hard you erase. Then I hung it up and did my first attempt at chalkboard art. 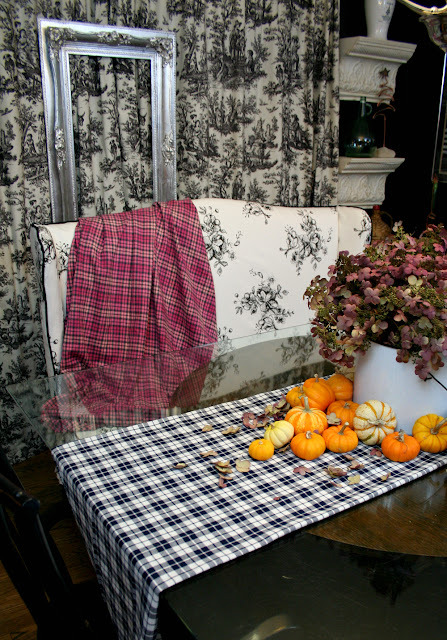 Funny, I meant for this to be "springy" - you know, bring a little spring into the house. I mean, it says the word sunshine! But it doesn't look very springy, does it? Apparently black walls, black chalkboard, and a dark, cloudy, non-springy Michigan day do not say "SPRING"! I tried drawing a little sun at the bottom but it just looked stupid. Not springy. So I guess I'll have to wait until spring to get springy pictures. Now let's talk silver leaf. I'm going to give you a tutorial. A tutorial with no pictures. It's that easy. Step one. Paint the piece you want to leaf a dark color. Sometimes red is good too - traditionally for gold leaf. Step two. Apply a thin coat of Metal Leaf Adhesive Sizing. This is the glue that holds on the leaf. Let it sit for about 20 minutes or until it becomes clear. Artist's brushes work for small areas, chip brushes work for large areas - like if you were leafing a ceiling or a piece of furniture. Step three. Lay a piece of leafing material over the area where you applied the sizing. Be gentle. The leaf is very delicate. Gently go over the leaf with a dry brush. Touch up uncovered spots until you are satisfied with the coverage. I use an artists brush for this - the size depends on the size of the area I'm working on. For this frame I would have used the largest brush of the set in the above link. Step four. Let it dry for a while - maybe a few hours and then burnish the leafed areas by briskly brushing with a soft paint brush. Step five. Opinions vary about what this step should be. 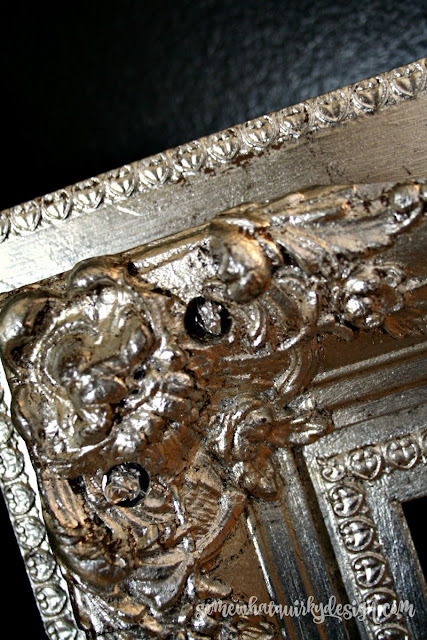 On this frame I used Country Living Paints Toner. It gives a slight antique look to your leafing. If you like the look just the way it is then you just use a Water Based Leafing Sealer. Note: Most of the leaf you buy will be imitation or a composition of genuine and imitation. In general the composite or imitation are less expensive than genuine leaf. So look over all label and product information carefully so you know what you are getting and paying for. I've never worked with genuine leafing before so I can't give any advice regarding it. Also if you know you are going to need a lot of leafing material go ahead and get a larger package. You will probably have to order this online. I ordered this package of gold, silver, and copper leaf a while back just because it was such a GREAT deal. You can also buy leafing in little bits called Metal Flakes. These are actually easier to use for small areas because I just lift a small bit with a brush and put it exactly where I need it. Disclosure: these are affiliate links. They are also the products that I use and I know they work. So get busy and leaf something for goodness sake! It will put sunshine in your soul. 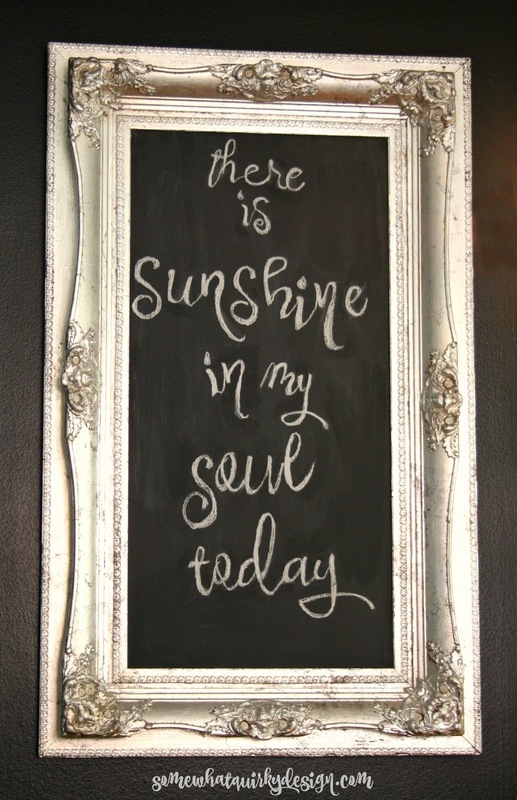 Even if it's cloudy outside! PS if you have any idea why the frame has holes in it please share! If you don't well that doesn't matter, just tell me how the heck you are! Well, you certainly made something wonderful! 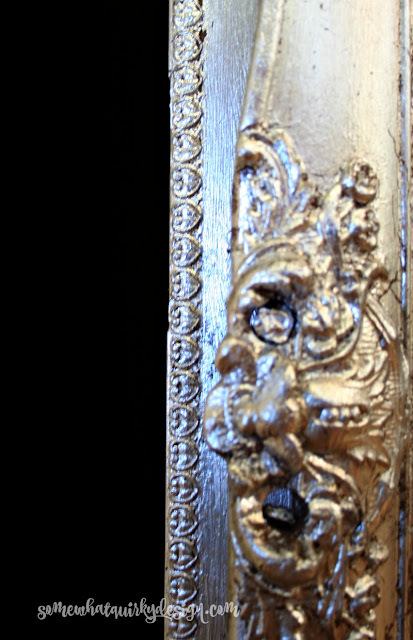 It doesn't matter if the frame isn't springy because it fits in your house with your style. 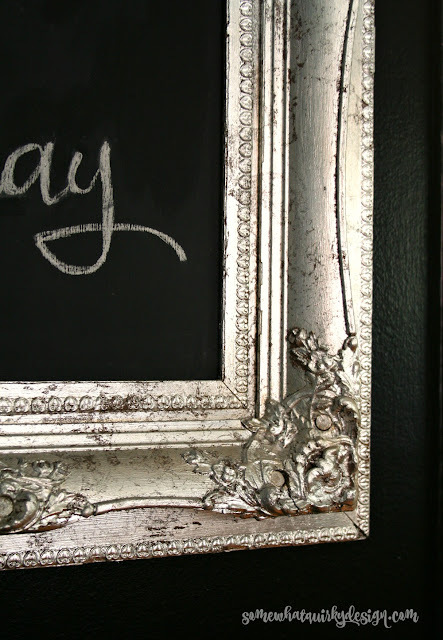 Lovely framed chalkboard. Hope someone does figure out why there were 12 holes in the frame. Good that you have graduated to a cane. The frame looks great and yes, I season my chalkboards! No clue why there's holes in the frame. Weird. You have nice handwriting. Mine is messy. Glad you've graduated to a cane! Won't be long and you'll be doing a Spring jig! Have a good rest of the week! 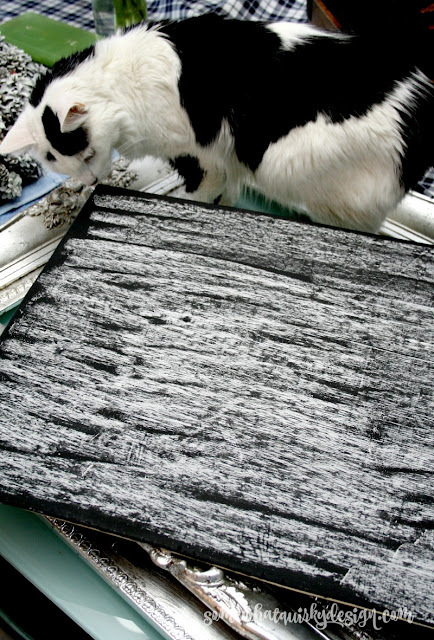 The chalkboard looks great, I love chalkboards, so glad they are so popular these days, I can find them everywhere. Glad your getting more mobile! And I am fine, thanks for asking. I believe some type of ornaments were removed from those holes. 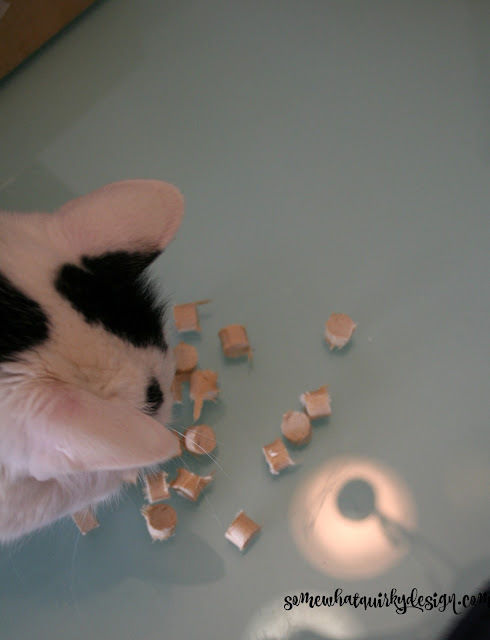 The dowel pieces obviously also make wonderful cat toys! Hi! I'm always out here, but rarely comment. But just wanted to say you have inspired me to try the leafing. You make it sound so easy, like even I could do it! But I will have to leaf it to another day! Pinned on my chalkboard board.